Perioperative Cardiovascular Evaluation: Is There a Role for Coronary Computed Tomography Angiography? By James L. Furgerson, M.D. Perioperative cardiovascular complications resulting from non-cardiac surgery are an important cause of morbidity and mortality. Using a step-wise approach and selective cardiac testing, those at highest risk of cardiovascular complications can be identified and offered medical therapy and revascularization — when indicated — in order to reduce the risk of perioperative myocardial infarction and other cardiovascular complications and improve their overall prognosis. Currently used non-invasive techniques have some limitations, especially in those who cannot exercise adequately prior to surgery. Coronary computed tomography angiography (CCTA) is now a well- established non-invasive technique which is very effective at identifying those with advanced multivessel and left main coronary artery disease and may have a future role in the cardiac evaluation of patients prior to non-cardiac surgery. In this review, current guidelines on perioperative cardiovascular evaluation are reviewed with a focus on non-invasive imaging techniques, including CCTA. Perioperative cardiovascular complications of moderate to high risk surgery are an important source of morbidity and mortality. Of the approximately 230 million noncardiac surgeries performed each year worldwide, approximately 2,300,000 major cardiovascular events and 690,000 cardiovascular deaths result.1 The short term mortality associated with perioperative MI (PMI) is estimated at 3.5-25%, and the occurrence of PMI results in substantial increases in hospital stay and cost.2,3 Identification of patients who are harboring advanced coronary artery disease prior to surgery may allow for optimal risk reduction for cardiovascular events in the perioperative period using medical therapy and selective revascularization. Current guidelines for preoperative cardiovascular assessment call for careful clinical assessment to identify active cardiovascular conditions, such as unstable angina, decompensated congestive heart failure, and severe valvular heart disease.4 In patients without active conditions, the use of additional testing to further define cardiovascular risk is controversial and is generally reserved only for cases when the outcome of such investigation will affect subsequent management. Consideration of noninvasive testing for coronary artery disease is appropriate when the patient will be undergoing intermediate or high risk surgery, has poor functional capacity, and carries three or more clinical risk factors. While exercise testing is preferred, preoperative patients are frequently not capable of exercising adequately, and a history of poor functional capacity exacerbates the problem of effectively exercising patients as a form of risk stratification prior to the planned procedure. For those patients who cannot exercise adequately, the following noninvasive options are available: vasodilator nuclear perfusion imaging, dobutamine stress echocardiography, dobutamine magnetic resonance imaging, vasodilator magnetic resonance perfusion imaging, and coronary CT angiography (CCTA). The diagnostic accuracy of these techniques is given in Table 1. Dobutamine stress echocardiography also has extensive prior investigational data associated with its use in the periprocedural period,4 and is a useful test in patients who can tolerate dobutamine infusion and have adequate acoustic windows for detailed myocardial imaging, which is required for this test. While the risk of dobutamine infusion is relatively low and acceptable in most situations, care must be used to avoid precipitating ischemia and or complex ventricular arrhythmia with the administration of this agent. Additionally, considerable expertise is required on the part of the echocardiographic technician in obtaining adequate images and similar expertise is required by the interpreting physician, which may not be available in many centers. Magnetic resonance imaging to detect inducible wall motion abnormalities with the infusion of dobutamine or by detection of perfusion defects with first pass imaging to vasodilator is well-developed in a few centers where operating characteristics are favorable compared with other noninvasive tests.8,9 However, this is not well proven in the perioperative setting. CCTA is known to be a highly sensitive modality for detecting coronary atherosclerosis and has received increasing acceptance after multiple clinical trials have shown very good accuracy when compared with invasive coronary angiography.10-12 Radiation exposure, use of radiocontrast media, and limited specificity when imaging patients with extensive coronary calcium, large body habitus, and irregular rhythm, have traditionally been detractors of this technology. However, with the latest technology, radiation exposure has become acceptable in most clinical scenarios, and arrhythmia and body habitus are less problematic than in the past. For preoperative patients who have undergone noninvasive testing, indications for preoperative invasive coronary angiography are similar to those identified in the nonoperative setting.13 Specifically, in the asymptomatic patient, the occurrence of high risk findings should lead to consideration for referral for invasive coronary angiography. Such high risk findings include greater than 10% ischemic myocardium or transient ischemic dilation by nuclear perfusion imaging, stress-induced wall motion abnormality in greater than or equal to two myocardial segments, or stress induced left ventricular dysfunction by stress echocardiography. In the patient with symptoms of ischemic heart disease, abnormal findings on noninvasive testing, baseline resting left ventricular dysfunction with a positive viability study, and high clinical suspicion of disease without further noninvasive testing would be indications for invasive coronary angiography. In a patient with established atherosclerotic heart disease, uncontrolled ischemic symptoms, which are worsening or limiting on medical therapy, and high risk findings by noninvasive testing might prompt referral for invasive coronary angiography. An ongoing clinical trial at Brooke Army Medical Center will examine the role of CCTA versus vasodilator nuclear perfusion imaging in the preoperative assessment of patients awaiting intermediate to high risk surgery with three or more clinical risk factors who cannot adequately exercise. Since many of the patients enrolling in the study will have peripheral vascular disease and by proxy underlying advanced coronary atherosclerosis, the presence of coronary calcium may become problematic in identifying patients with left main and proximal three-vessel disease by CT angiography. Conversely, with a relatively high pretest likelihood of advanced coronary atherosclerosis, the potential for a false negative vasodilator perfusion scan related to balanced ischemia will be a potential risk of the vasodilator perfusion imaging in this setting. If adequate coronary imaging can reliably be performed in this group of patients which will likely have rather advanced atherosclerosis, it is felt that CT coronary angiography will be an ideal method to identify patients at risk of ischemic complications in the perioperative period, as well as identifying patients who will benefit from prophylactic coronary revascularization and additional medical therapy. Perioperative cardiovascular complications resulting from non-cardiac surgery are an important cause of morbidity and mortality. Using a step-wise approach and selective cardiac testing, those at highest risk of cardiovascular complications can be identified and offered medical therapy and revascularization when indicated in order to reduce the risk of perioperative myocardial infarction and other cardiovascular complications and improve their overall prognosis. Currently used non-invasive techniques have some limitations, especially in those who cannot exercise adequately prior to surgery. Coronary computed tomography angiography (CCTA) is now a well- established non-invasive technique which is very effective at identifying those with advanced multi- vessel and left main coronary artery disease. Since much of the data supporting current guidelines on medical management and coronary revascularization of those at risk for perioperative adverse cardiovascular events are based on the presence and severity of anatomic coronary stenoses, there is a strong rationale for use of CCTA in the preoperative assessment of these patients. 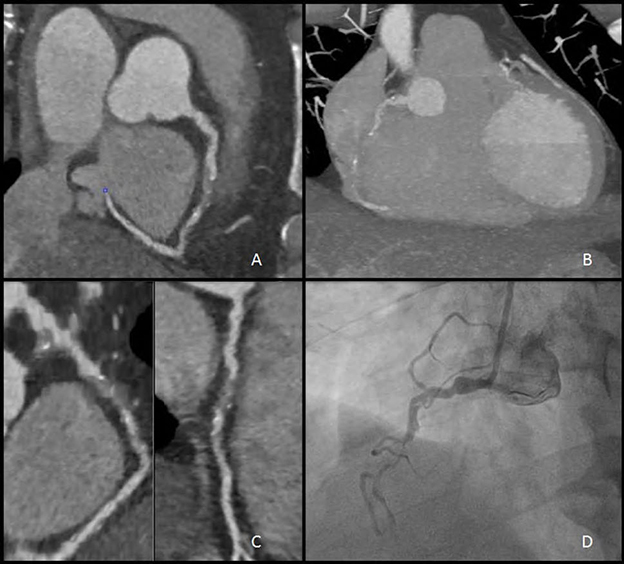 Additional research data are needed to establish CCTA as an effective means of cardiovascular risk assessment prior to intermediate or high risk surgery. With further improvements in CCTA imaging technology, which will lessen the impact of coronary calcium on image quality, and additional research efforts, it is likely that CCTA will be accepted as an effective means of preoperative risk assessment strategies. Mackey WC, Fleisher LA, Haider S, et al. Perioperative myocardial ischemic injury in high-risk vascular surgery patients: incidence and clinical significance in a prospective clinical trial. J Vasc Surg. 2006;43(3):533-8. Landesberg G, Beattie WS, Mosseri M, et al. Perioperative myocardial infarction. Circulation. 2009;119(22):2936-44. Fleisher LA, Beckman JA, Brown KA, et al. ACC/AHA 2007 guidelines on perioperative cardiovascular evaluation and care for noncardiac surgery: a report of the American College of Cardiology/American Heart Association Task Force on Practice Guidelines (Writing Committee to Revise the 2002 Guidelines on Perioperative Cardiovascular Evaluation for Noncardiac Surgery) developed in collaboration with the American Society of Echocardiography, American Society of Nuclear Cardiology, Heart Rhythm Society, Society of Cardiovascular Anesthesiologists, Society for Cardiovascular Angiography and Interventions, Society for Vascular Medicine and Biology, and Society for Vascular Surgery. J Am Coll Cardiol. 2007;50(17):e159-241. Shaw LJ, Eagle KA, Gersh BJ, et al. Meta-analysis of intravenous dipyridamole-thallium-201 imaging (1985 to 1994) and dobutamine echocardiography (1991 to 1994) for risk stratification before vascular surgery. J Am Coll Cardiol. 1996;27(4):787-98. Hendel RC, Whitfield SS, Villegas BJ, et al. Prediction of late cardiac events by dipyridamole thallium imaging in patients undergoing elective vascular surgery. Am J Cardiol. 1992;70 (15):1243-9. Berman DS, Kang X, Slomka PJ, et al. Underestimation of extent of ischemia by gated SPECT myocardial perfusion imaging in patients with left main coronary artery disease. J Nucl Cardiol. 2007;14(4):521-8. Jaarsma C, Leiner T, Bekkers SC, et al. Diagnostic performance of noninvasive myocardial perfusion imaging using single- photon emission computed tomography, cardiac magnetic resonance, and positron emission tomography imaging for the detection of obstructive coronary artery disease: a meta- analysis. J Am Coll Cardiol. 2012;59(19):1719-28. Nagel E, Lehmkuhl HB, Bocksch W, Klein C, Vogel U, Frantz E, et al. Noninvasive diagnosis of ischemia-induced wall motion abnormalities with the use of high-dose dobutamine stress MRI: comparison with dobutamine stress echocardiography. Circulation. 1999;99(6):763-70. Meijboom WB, Meijs MF, Schuijf JD, et al. Diagnostic accuracy of 64-slice computed tomography coronary angiography: a prospective, multicenter, multivendor study. J Am Coll Cardiol. 2008;52(25):2135-44. Budoff MJ, Dowe D, Jollis JG, et al. Diagnostic performance of 64-multidetector row coronary computed tomographic angiography for evaluation of coronary artery stenosis in individuals without known coronary artery disease: results from the prospective multicenter ACCURACY (Assessment by Coronary Computed Tomographic Angiography of Individuals Undergoing Invasive Coronary Angiography) trial. J Am Coll Cardiol. 2008;52(21):1724-32. Miller JM, Rochitte CE, Dewey M, Arbab-Zadeh A, Niinuma H, Gottlieb I, et al. Diagnostic performance of coronary angiography by 64-row CT. N Engl J Med. 2008;359(22):2324-36. Patel MR, Bailey SR, Bonow RO, et al. ACCF/SCAI/AATS/AHA/ASE/ASNC/HFSA/HRS/SCCM/SCCT/SCMR/STS 2012 Appropriate Use Criteria for Diagnostic Catheterization: A Report of the American College of Cardiology Foundation Appropriate Use Criteria Task Force, Society for Cardiovascular Angiography and Interventions, American Association for Thoracic Surgery, American Heart Association, American Society of Echocardiography, American Society of Nuclear Cardiology, Heart Failure Society of America, Heart Rhythm Society, Society of Critical Care Medicine, Society of Cardiovascular Computed Tomography, Society for Cardiovascular Magnetic Resonance, and Society of Thoracic Surgeons. J Am Coll Cardiol. 2012;59(22):1995-2027. Dawood MM, Gutpa DK, Southern J, et al. Pathology of fatal perioperative myocardial infarction: implications regarding pathophysiology and prevention. Int J Cardiol. 1996;57(1):37-44. Landesberg G. Monitoring for myocardial ischemia. Best Pract Res Clin Anaesthesiol. 2005;19(1):77-95. McFalls EO, Ward HB, Moritz TE, et al. Coronary-artery revascularization before elective major vascular surgery. N Engl J Med. 2004;351(27):2795-804. Schouten O, van Kuijk JP, Flu WJ, et al. Long-term outcome of prophylactic coronary revascularization in cardiac high-risk patients undergoing major vascular surgery (from the randomized DECREASE-V Pilot Study). Am J Cardiol. 2009;103 (7):897-901. Dunkelgrun M, Boersma E, Schouten O, et al. Bisoprolol and fluvastatin for the reduction of perioperative cardiac mortality and myocardial infarction in intermediate-risk patients undergoing noncardiovascular surgery: a randomized controlled trial (DECREASE-IV). Ann Surg. 2009;249(6):921-6. Mangano DT, Layug EL, Wallace A, et al. Effect of atenolol on mortality and cardiovascular morbidity after noncardiac surgery. Multicenter Study of Perioperative Ischemia Research Group. N Engl J Med. 1996;335(23):1713-20. Poldermans D, Boersma E, Bax JJ, et al. The effect of bisoprolol on perioperative mortality and myocardial infarction in high- risk patients undergoing vascular surgery. Dutch Echocardiographic Cardiac Risk Evaluation Applying Stress Echocardiography Study Group. N Engl J Med. 1999;341 (24):1789-94. Devereaux PJ, Yang H, Yusuf S, et al. Effects of extended- release metoprolol succinate in patients undergoing non- cardiac surgery (POISE trial): a randomised controlled trial. Lancet. 2008;371(9627):1839-47. Patel MR, Dehmer GJ, Hirshfeld JW, et al. ACCF/SCAI/STS/ AATS/AHA/ASNC/HFSA/SCCT 2012 appropriate use criteria for coronary revascularization focused update: a report of the American College of Cardiology Foundation Appropriate Use Criteria Task Force, Society for Cardiovascular Angiography and Interventions, Society of Thoracic Surgeons, American Association for Thoracic Surgery, American Heart Association, American Society of Nuclear Cardiology, and the Society of Cardiovascular Computed Tomography. J Thorac Cardiovasc Surg. 2012;143(4):780-803. Monaco M, Stassano P, Di Tommaso L, et al. Systematic strategy of prophylactic coronary angiography improves long- term outcome after major vascular surgery in medium- to high-risk patients: a prospective, randomized study. J Am Coll Cardiol. 2009;54(11):989-96. Meijboom WB, Van Mieghem CA, van Pelt N, Weustink A, et al. Comprehensive assessment of coronary artery stenoses: computed tomography coronary angiography versus conventional coronary angiography and correlation with fractional flow reserve in patients with stable angina. J Am Coll Cardiol. 2008;52(8):636-43. Taylor AJ, Cerqueira M, Hodgson JM, et al. 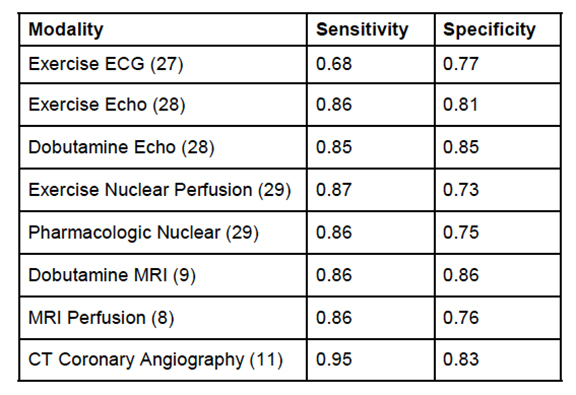 ACCF/SCCT/ACR/ AHA/ASE/ASNC/NASCI/SCAI/SCMR 2010 Appropriate Use Criteria for Cardiac Computed Tomography. A Report of the American College of Cardiology Foundation Appropriate Use Criteria Task Force, the Society of Cardiovascular Computed Tomography, the American College of Radiology, the American Heart Association, the American Society of Echocardiography, the American Society of Nuclear Cardiology, the North American Society for Cardiovascular Imaging, the Society for Cardiovascular Angiography and Interventions, and the Society for Cardiovascular Magnetic Resonance. Circulation. 2010;122(21):e525-55. Hoffmann U, Bamberg F, Chae CU, et al. Coronary computed tomography angiography for early triage of patients with acute chest pain: the ROMICAT (Rule Out Myocardial Infarction using Computer Assisted Tomography) trial. J Am Coll Cardiol. 2009;53(18):1642-50. PMCID: 2747766. Gibbons RJ, Balady GJ, Bricker JT, et al. ACC/AHA 2002 guideline update for exercise testing: summary article. A report of the American College of Cardiology/American Heart Association Task Force on Practice Guidelines (Committee to Update the 1997 Exercise Testing Guidelines). J Am Coll Cardiol. 2002;40(8):1531-40. Cheitlin MD, Armstrong WF, Aurigemma GP, et al. ACC/AHA/ ASE 2003 guideline update for the clinical application of echocardiography--summary article: a report of the American College of Cardiology/American Heart Association Task Force on Practice Guidelines (ACC/AHA/ASE Committee to Update the 1997 Guidelines for the Clinical Application of Echocardiography). J Am Coll Cardiol. 2003;42(5):954-70. Klocke FJ, Baird MG, Lorell BH, et al. ACC/AHA/ASNC guidelines for the clinical use of cardiac radionuclide imaging-- executive summary: a report of the American College of Cardiology/American Heart Association Task Force on Practice Guidelines (ACC/AHA/ASNC Committee to Revise the 1995 Guidelines for the Clinical Use of Cardiac Radionuclide Imaging). J Am Coll Cardiol. 2003;42(7):1318-33. Prospective Multicenter Imaging Study for Evaluation of Chest Pain (PROMISE). http://clinicaltrials.gov/ct2/show/NCT01174550, accessed July 14, 2012. Furgerson JL. Perioperative Cardiovascular Evaluation: Is There a Role for Coronary Computed Tomography Angiography?. J Am Osteopath Coll Radiol. 2013;2(2):8-13. Dr. Furgerson works with the Cardiology Service, Brooke Army Medical Center, Fort Sam Houston, TX.